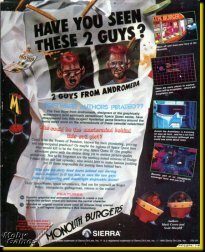 This interview with Guys from Andromeda Mark Crowe and Scott Murphy (conducted by Nancy Grimsley) originally appeared in the Spring 1989 issue of The Sierra Newsletter, just around the time of the release of Space Quest 3: The Pirates of Pestulon. 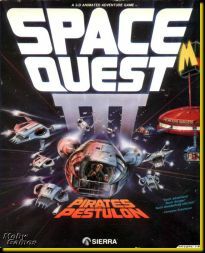 Mark Crowe and Scott Murphy are the designers of the Space Quest adventure games put out by Sierra On-Line. Not only did they conceive the idea and write the story, they are the major programmers on the game--to oversimplify their roles Mark does the pictures and Scott makes the characters move and respond. In a recent interview they talked about the process of creating an adventure game. As the interview progressed I had an opportunity to notice their partnership in action. After I asked a question, one of them would have a response and often no sooner would he finish than the other would smoothly dove-tail an additional response. Some of the answers came from both of them contributing phrases in turn that fitted together like pieces of a jigsaw puzzle. It didn't look to me like a particularly conscious process, but it appeared to be a comfortable technique, without any taint of contentiousness, irritation, or competitiveness. They laughed a lot. See for yourself. Here is how it went. How did you each get your start in your craft, programming and computer graphics? Mark: I started with Sierra six years ago working for the Art Department designing packaging and documentation and what not, so I used my illustration skills there. My first computer graphics project was creating the graphics for Winnie the Pooh and the One Hundred Acre Wood. Then I did animation for King's Quest II and following that I did some animation for Black Cauldron which was the first project Scott and I worked on together. I believe that was also his first job creating source code for the games. Scott: I didn't start doing this. It was an accident. I saw an adventure game before I worked here and I liked it. I had a job I hated and I kept bugging Sierra until they let me come and work as a dealer returns person. And I kept learning things. I kept learning product in my spare time and learning how to support stuff. So I became a support rep for games and then for business products, then I ended up managing the support department. Then the big crunch hit and I started doing QA work as well as support stuff. As I got closer to where they were creating the games I saw Mark and Doug MacNeill working on graphics for King's Quest II and Black Cauldron and I started bugging Ken (referring to Ken Williams, the company president) to let me try. I saw people working on programming and I knew that if they could do it, I could do it. So I kept bugging Ken and finally he let me try it. I put in a lot of free time over a summer spending nights out at his house debugging Black Cauldron. And then I ended up being the only one working on it. After a while Ken and Al Lowe bailed out on me. So I got Black Cauldron shipping and that was the first thing I worked on as far as a game. I got bit by the bug then. It sounds like a story of persistence paying off. How did you two get started together? Mark: We were both working on Black Cauldron together. We're really into science fiction and space and that sort of thing and together we decided to work up an idea for a game that would deal with that genre--science fiction--and we wanted it to take place in space. So we put together a demo. I did the graphics, and Scott did the code. Scott: We showed it to Ken and he said sure it looks like a game. Go with it. About a year earlier we had asked Ken about a space game and he said no it doesn't sound good. So this time we just had it all ready and showed it to him, rather than just approaching him with an idea. And once he saw what was on screen and how it looked and how it felt, that really helped a lot. Mark's graphics did a lot, too. How do you two work, together or apart? Mark: We both have a real strange sense of humor. So we bounce weird ideas off each other and use each other as a catalyst. Scott, as an aside: Fortunately for people who play the games, most of them don't get in. Mark: We spend time working alone at our houses and we work together here at Sierra. It works out real well. One of the things I really enjoy is the humor in the games. How do you go about trying to cover all the bases that a user might try? Mark: You have to sit down and go through each picture and try to put yourself in the mindset of someone who has never seen this before. You have to ask yourself if you were walking around in this world, what would you try to do. Scott: You can only do it so well, unfortunately. That is where QA people and the Beta testers come in. They type in weird stuff and sometimes that may prompt a weird response, and it will end up staying in the game. Something specifically addressed to one person gets into the game and sometimes it sounds funny enough and it stays. I keep finding messages that I forgot I put in. How long goes it take you to design a game from conception to shipping? Mark: We've been working on this one for a little over a year. Scott: But this one was a special case. We have a brand new development system. I had to learn a whole new language to program. The other two were done on AGI and this is SCI. Totally different worlds. I had to learn something and understand something I had no concept of to start with. The other two came out in a period of approximately 9 to 11 months. So we were pretty consistent there. We don't start out with a huge document. We start out with a couple of ideas, where we are going to start and where we are going to end, and some of the things that are going to happen in between, and work our way there. Does it change substantially from your original design by the time everybody else who is involved in it gets through? Scott: Not a great deal. Mark: We always start aiming really high and we always fall short of our goal, I think, but in the long run we come up with a pretty good product. Our customers are beginning to become familiar with SCI and AGI. How is it different to work with SCI, from your point of view? I was fascinated with some of the depth perception I saw. For example in the opening credits--the letters are in the foreground and the stars far in the back. Mark: The new interpreter has allowed us to come up with a lot of great special effects and from a graphics standpoint the new language gives us twice the resolution. I don't want to say pictures take twice as long, but they do take a lot longer because you have more to work with. You can put more detail in the graphics. Folks out there will have to be a little more patient about how soon we can get these things out. Scott: Before, Mark had a limited area to work in and he could only do so much. Now he's tempted to think, "Wow! I could do this," or "Maybe I could add that." So he's trying to restrain himself. I wanted to ask about the sound effects, too. The other day I chased a wind sound clear across the room to see what it was, and it was from Space Quest III. It was so real I could practically feel the chilliness of it. How do you develop your sound effects? Mark: That is the work of Mark Siebert, our in-house music person using the Roland MT-32 synthesizer. Scott: Mark (Siebert) has learned a lot of ways to push the synthesizer around and make it do things. He's come up with good effects that weren't available for some of the earlier games. We are benefitting from his time on the earlier projects. I understand the MT-32 is the equivalent of 8 synthesizers in 1. Mark: Right. Mark is able to take preset voices and manipulate them somehow to make them sound like anything he wants. Scott: One of the things he is doing now is actually loading sound effects into the MT-32. he is changing some of the ways the voices are set and is customizing them for the game. In fact it is taking 45 extra seconds just to load the game now. You can notice the light on the MT-32 flashing at the beginning for a long time while sounds are loading. Mark: Not to brag, but it seems like everyone at Sierra who has played the game is inspired to come up with new things, like sounds, for instance. Scott and I have come up with a lot of strange ideas and effects that have caused the interpreter to change because the system programmers were inspired to make the interpreter do more. 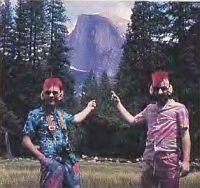 They enjoyed it, too, and those changes inspired us as well. Scott: There are some changes the system programmers think might be stupid, or that the return would be so small why bother, but when they are playing the game they get pretty psyched-up--they get like little kids sometimes. It gets them going, and it has helped us get some new things out of them. It gets us going too. The game not only has the sound effects, but for music you have a collaborator. Mark: Right. Bob Siebenberg of the rock group Supertramp. How does that collaboration work? Mark: Very well. We just give him a video tape of the scene, not unlike what a movie score writer would do. And he takes the moods that we want to come across and writes music for that particular scene. Mark: ...that it wasn't quite right. Scott: But he turned out to be really open to suggestion, and had no ego that we could see. It has been very interesting. We've enjoyed it. Mark: We've been very open-minded, too, as players of the game will see when they hear a completely different Space Quest theme song that has really caught on and you can hear people whistling it and humming it around the building. It's a catchy tune. Scott: The original theme was actually Mark's composition and Bob has taken the original theme and worked with it and changed it. So Mark gets some credit there also because that thing has held on quite well. Do you enjoy playing your games after they are finished? Mark: For me they are the only ones I enjoy playing. I don't really care for the dungeons and dragons type thing myself. I'm more into the space thing, as Scott is, and I think we try to create a game that we would enjoy playing. That's our goal. We are trying to please ourselves more than anyone else. In these games a user can type in all sorts of questions and get a wide variety of responses. Do you ever think of new things to ask as you go along and the response surprises you, or do you know what it is going to say? Scott: I surprise me because sometimes I'll put things in late at night and I'll forget about them. It will be some really obscure thing and I won't see it for nine months and all of a sudden I'll be showing some people the game and they'll give me a question to type in and I'll do it but I'll think I didn't put anything in for that, and then there comes some response. Sometimes they're embarrassing and sometimes they are not. I've wondered if you have any favorite bugs. Do you ever want to leave some bugs in the game? Mark: Oh, I don't think bugs per se. But we like to slip little secret things in that most people probably would never find. Going back to my first project, King's Quest II, probably a lot of people saw the Batmobile peeling out of the cave. So we like to stick little things like that into the games. Scott: Sometimes Roger Wilco gets stuck. We had one today where he was standing on his head and you could move him around. As a programmer I don't think I have any bugs I could call favorites. No bug is a good bug. We've had some interesting bugs though. Do your families--parents and wives--enjoy playing computer games? Do they understand what you are about? Scott: Well my wife does sort of but she's a little mystified by it. She enjoys the adventure game; she likes mysteries and so it's a natural for her. As far as them understanding what we do or trying to explain it to anybody else--Mom, Dad, sisters, in-laws--they just say "Well, I'm glad for you," and they start talking about the weather. What advice would you have for readers longing to get into programming and computer graphics? They both laughed and Mark said "Don't do it." Mark: Just kidding. You've got to realize we are at the end of a project. We've spent the last thirteen months thinking about this. There is a lot more involved than most people think. We get letters every day from people with ideas for games. It's not that simple. There is a lot of thinking that goes into these things. Scott: Not to mention being able to endure the whole process of creating the game and then finding that happy medium where you can entertain an 8-year-old and a 30 or 40-year-old. You have to have different things to entertain--have something in there for the adult that is not too childish for for the kid that is not too adult. There are so many things that you just can't imagine that you have to deal with when you create one of these games. You just have to be prepared. Is the technology keeping up? Does it frustrate you that you cannot do some things you want to do? Scott: Things are going good, in my opinion, except for data storage. Disk drives are still way too slow. And we are still dealing with 360k floppies when you could have 1.4 meg 3-1/2" floppies. That's where I'm frustrated. We are getting better colors, we're getting more resolution, we're getting a little more memory to work with. But it seems like the disk drive is still the ultimate problem right now. Sending out a game with eight disks in it... that's ridiculous. Mark: My goal is to see the entire screen animated. I want to see everything move. And of course that is just not practical. So it is frustrating for me to do these little bits of animation here and there. Scott: That's true. I'd lik eto see a higher percentage of the screen animated without having it move at a snail's pace. Do you have your next game in mind yet? Scott: People in upper management have been asking that every day. Actually, they have been working to split us because they feel like if they split us into two teams they can get twice as many products. I think that's on their minds now. They have Mark lined up for a separate project, and I don't know exactly what I'm going to be doing. I have a couple of ideas but I haven't had a chance to talk with anybody officially yet because of this project. Mark: The next project I'm on is a horror game and there's going to be a lot of gruesome blood and guts. It's not going to be you kiddy game--I guess R rated is the term I would use--it's going to be scary. It's going to be a challenge trying to make a game on a computer that scares you. That's my goal.